Actor Joaquin Phoenix was nominated for an Oscar and won a Golden Globe for his performance as Johnny Cash in the 2005 film Walk The Line. He did his own singing but he isn't a singer. He comes from a family of actors. He was born Oct. 28, 1974 in Rio Piedras, Puerto Rico. His family traveled around like hippies and all the kids did street performing to earn money. He followed his older brother River into acting in the early 80s. At first he called himself Leaf Phoenix but he later changed his name back to Joaquin. The 1989 film Parenthood was his biggest film as Leaf Phoenix. When River died in 1993, Joaquin quit acting for a couple of years. But then he returned as Joaquin Phoenix in the 1995 film To Die For. Since then he has been very busy. He was nominated for an Oscar for his performance in the 2000 film Gladiator. Walk The Line is his biggest starring role. Johnny Cash and wife June Carter Cash appeared on a 1993 episode of Dr. Quinn, Medicine Woman. Series star Jane Seymour is married to director James Keach. Cash asked Keach to produce a biopic. Keach hired James Mangold to develop the project. It was supposed to be done at Sony but they turned it down and Fox 2000 picked it up. Mangold looked at several actors to play Cash but he really liked Phoenix though it appears Phoenix himself wasn't convinced he was the right choice. Mangold decided to have the actors do their own singing and T-Bone Burnett produced the music. The film was very successful and Phoenix was nominated for an Oscar. It's the only time Phoenix has sung on film and he isn't planning to do any more music. Phoenix is still active. His latest film Irrational Man directed by Woody Allen was released last year. He announced plans to star in the Western Far Bright Star directed by his brother in law Casey Affleck. 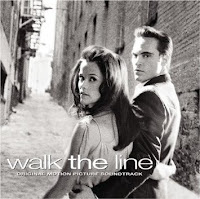 Here's a video for I Walk The Line that mixes the Johnny Cash and Joaquin Phoenix recordings.